I hope you all had an amazing weekend while celebrating the 4th! We spent our long weekend soaking up the sunshine by the water and it was exactly where I needed to be. Sometimes getting away, even if it's just for a few days, helps you hit the reset button. Charleston is one of our favorite places to sneak away to and one of the most beautiful, in my opinion. I'll be sharing more photos from our trip later this week! In the meantime, I couldn't love this Summer-y outfit any more. I recently fell in love with Everlane and want every single thing they have on their site. It's all so luxurious and cozy. 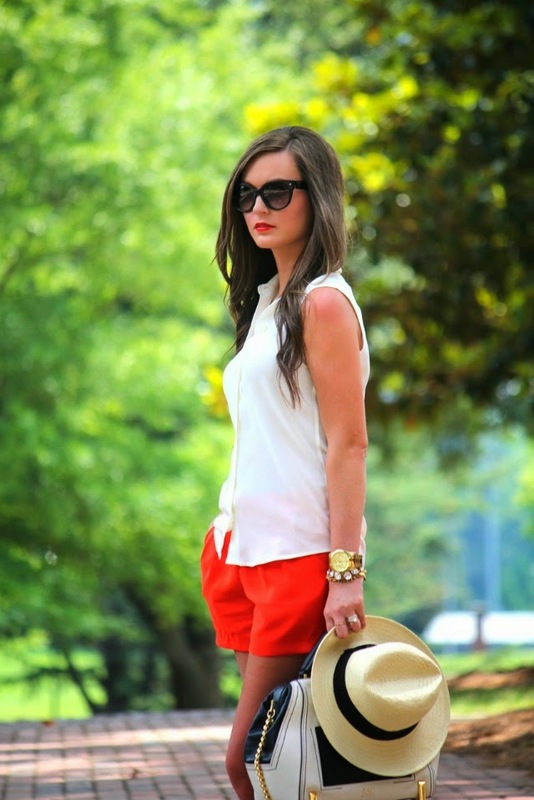 Not to mention, these poppy shorts from Sideline Sass are such a staple piece for any closet. They have this adorable little scallop waistband, so I'll definitely be wearing them again with something else that's tucked in. 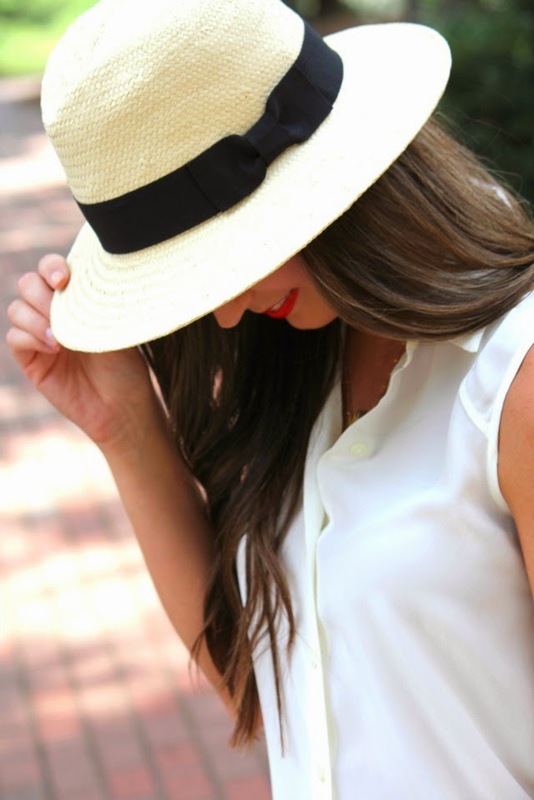 Throw on a pair of chic sandals + a panama hat and you're good to go! Also, I wanted to take a second to thank all of you for your constant support, sweet words and encouragement. What started as a fun, creative outlet and a side hobby, has quickly turned into something so much more and it's all because of you. I SO appreciate you reading and following along on my little space of the blogging world and can't wait to see where the future takes us. You guys are the best! I love Charleston too and I'm glad you had such a great time! Love this look! loving this outfit. so patriotic. Happy fourth (belated) lol! I love weekend getaways! They really do help clear your head and give you a much needed break. Loving this outfit also. 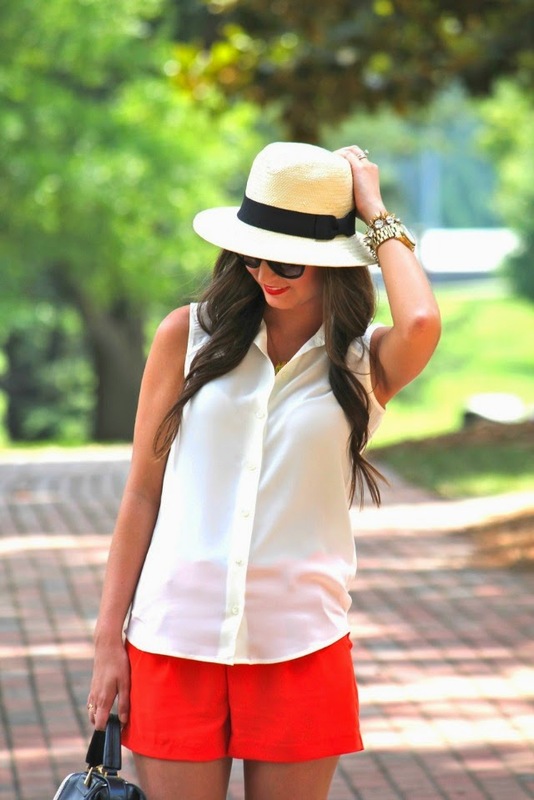 The crisp white button up looks awesome with the red/coral shorts and the adorable panama hat! I am a fan of that Zac Posen bag. It's been on my list of things to purchase forever and I haven't made the jump. Love how you wore it with this outfit! 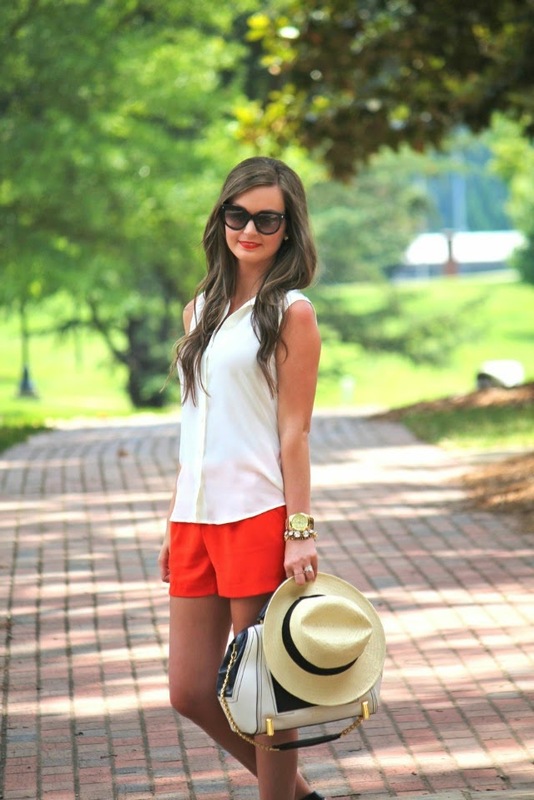 I'm loving the bright shorts paired with your subtle top! Such a perfect weekend look Megan. Love the bright pink shorts!